OVER 50,000 people from all walks of life visited the 1Malaysia National Horse Show held at the Selangor Turf Club racecourse in Sungai Besi last weekend. Yang di-Pertuan Agong Tuanku Mizan Zainal Abidin launched the 17th edition of the event last Saturday. Accompanied by Raja Permaisuri Agong, Tuanku Nur Zahirah and their daughter Tengku Fatimatuzzahra, the royal couple watched the first ever archery on horseback performed by Adruja Horseback Archery Club. On target: A rider showing off his archery skill during the National Horse Show. Clad in their traditional Malay attire, the team of three riders displayed the different hunting styles from the Korean and Turkish origins. The Royal Malaysian Police team also demonstrated an outstanding performance of Equestrian Vaulting with riders doing acrobatic stunts and gymnastic skills astride a horse. Visitors were thrilled by the challenges of seeing men and horses in action in events like dressage, showjumping and combined driving. Guests at the event included Armed Forces chief General Tan Sri Zulkifeli Mohd Zin , Royal Armour Corps director Brigadier General Datuk Adnan Abu Bakar and Terengganu Tourism, Culture and Heritage Committee chairman Datuk Abdul Rahin Mohd Said. Selangor Turf Club chairman Tan Sri Richard Cham, said in his welcoming speech that since 1994, the National Horse Show has played a pivotal role in the expansion of equestrian sports in Malaysia. “Today, there are many more national, regional and international equestrian competitions, and more trained and skilled professionals in veterinary practice, farriery, coaching, stable management and equestrian sports”. “Throughout its 16 years, the National Horse Shows have pioneered many firsts in contributing many key developments towards the industry, so much so that the National Horse Show was known as “The nation’s premier equestrian event” and today, I am pleased to say that the players of the equine industry are reaping the benefits from this growth,” said Cham. 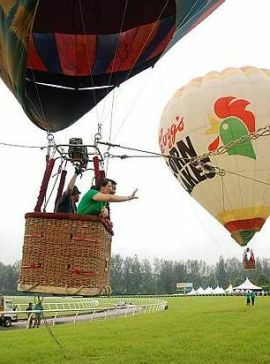 High flyers: Visitors enjoying the hot air balloons ride at the event. During the event, visitors were able to acquire information on the career opportunities available within the industry at the Expo Village. The equine sector provides ample job opportunities such as stable management, coaching, veterinarian, stewarding, sports handicapping and farriery. Other attractions at the expo village were a display of equine-related products and services, international farriery competition, pony and carriage rides, display of horse breeds, and carriages from different eras. There were extreme sports for teenagers, non-stop stage performances, games, treasure hunts, colouring competition and 1Malaysia Happy Faces corner. Tuanku Mizan presented prizes to the winners of the 80km FEI 1* Endurance Ride held a weekend earlier at Paya Indah Wetland, Selangor. 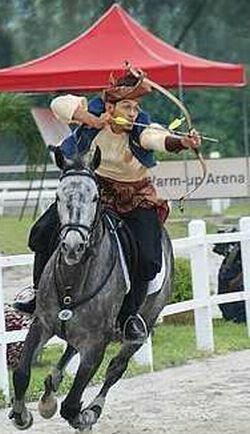 Noor Nerina Ernie Hasim on Bilad El Arab from Terengganu Endurance Team clinched the top prize while the Royal Terengganu Endurance Stable won the Best Team Category. The king also presented a total of RM25,000 to five charitable organisations. Winners of the 20km Charity Endurance Ride held in the morning on the same day donated their cash winnings to the five charities.